Great touring bike in the Alps and you guys are sooo lucky! I know there are lots of questions from people if this bike is good for touring, etc. 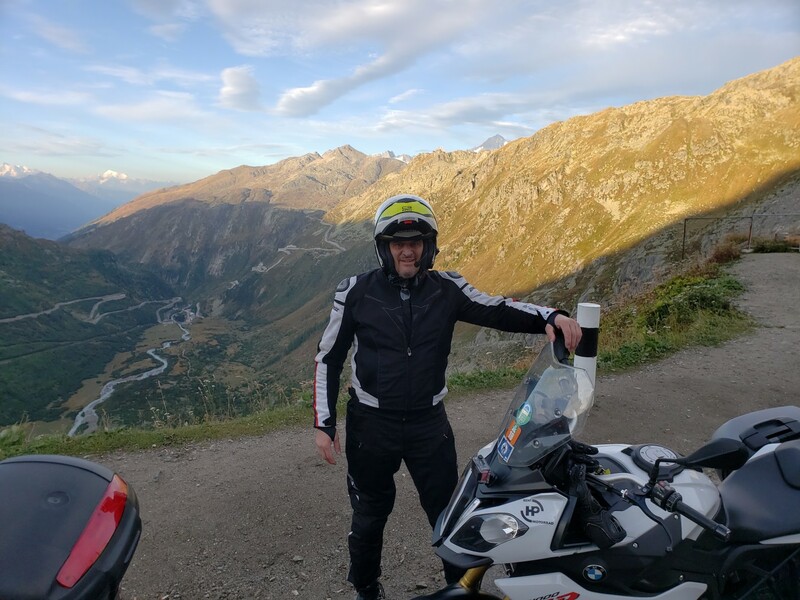 I just got back from a 9 day trip, with 1 down day, 1900 miles/3070 km around the Alps on a rented XR. For this type of riding, hands down, the XR is just and AWSOME bike to ride. 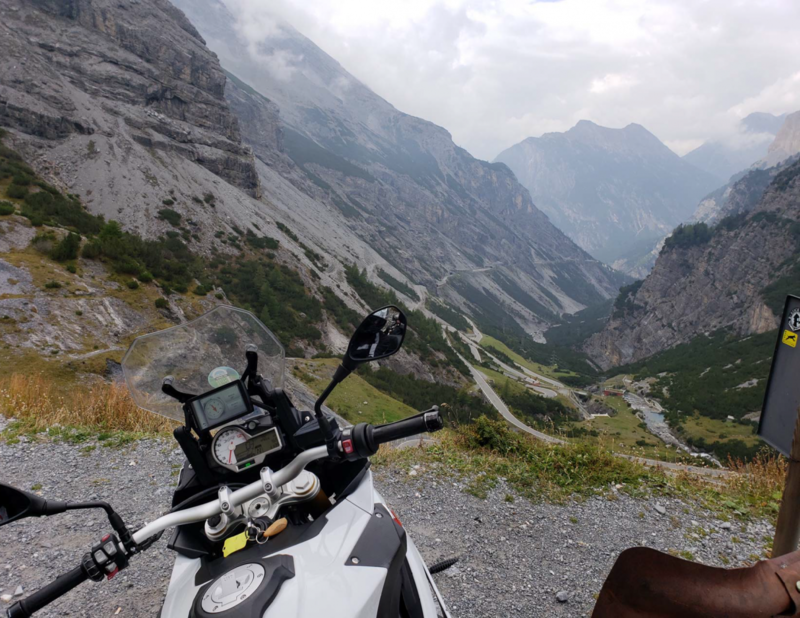 Stelvio Pass, Gotthard Pass, Furka Pass as well as Milan, Croatia, Slovenia, Berchtesgaden, Stelvio, Furka, Mt. Blanc in Chamonix, through the balcony roads to Nice, France, back up the cost through Genova to Milan. The XR had 45,000 miles on it and ran beautifully. There was definitely some valve ticking going on, but no performance problems during the trip. You know these rental bikes get ridden hard and sometimes poorly, but I had no issues. The other rider I went with rented an RT. It was perfect for him, too wide for me, but I like a sportier bike. We did not intend to ride as many hours as we did, but so glad it ended up that way. Lesson learned, GoogleMaps figures you can go the speed limit through the Alps, you cannot. What I showed was and average of 4.5 hours a day on GoogleMaps turned into 8 to 12 hours a day, including lunch and gas stops. Neither of us complained as these bikes were sooo awsome! (I would recommend riding the passes early in the morning if possible, very little traffic was encountered). One of the always present question is the buzz of the bike. It was not present on this bike. I don't know if they did mods or it smoothed out, but I never felt a problem. I did feet a bit more when we took a short 20 minute jaunt without gloves in Monaco, but this was way out of character for me as I typically always wear full gear. My touring gloves are race type gloves with thin tactile leather on the palms, no problems with the buzz. 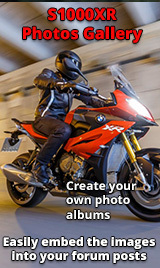 I did find out where all of the other XR's are being ridden! We see very few of them in California. As we went over the passes in Germany, Italy and Austria, I saw more XRs than I have ever seen in my life! I would say they were the King of the Passes! We did see quite a few GS and RT models and an occasional K1600. We did see quite a few naked KTM bikes, but a huge amount of XRs. The built in GPS was fabulous! I have the Navigator V and the other rider rented the VI. I believe we avoided any tickets with the camera location feature, but we shall see. Lastly, I'm hugely jealous of you guys over the pond! This was such a spectacular ride I'm still in awe I was able to experience it! I have more images I might post. 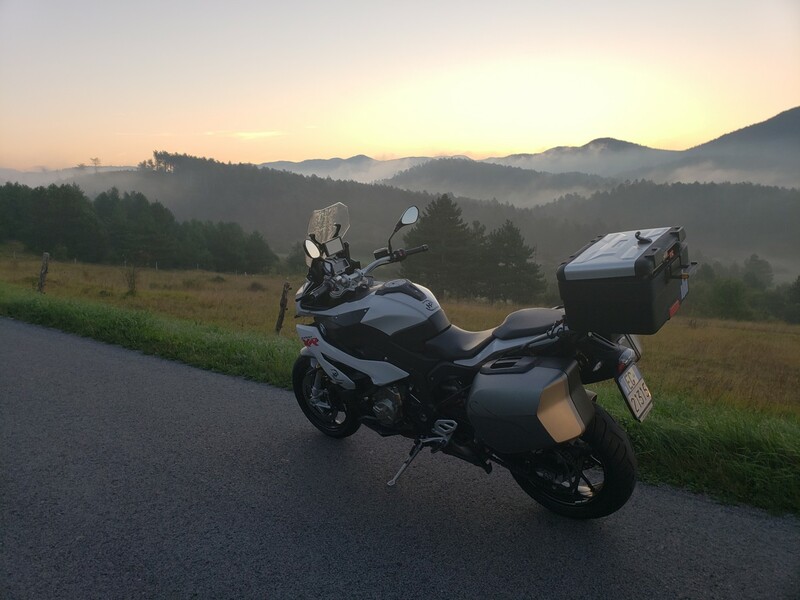 Here is a sunrise in Slovenia and getting ready to do the backside of Stelvio. Re: Great touring bike in the Alps and you guys are sooo lucky! Awesome trip man, I'm jealous. I'm happy to read you can rent out the XR, I'd love to do the trip myself. A friend of mine just got home yesterday from a very similar ride in the same general area (Edelweiss I believe). His perspective was exactly the same. He loved the bike!! FYI, rented at HPMotorrad in Milan, Italy. I would highly recommend. It was about 1,100 euro for the rental with unlimited miles from Friday to the following Saturday. It came with bags. Easy weekend drop off as well. They have 297 bikes, lots of selection. The only item I would note, careful if you are going out drinking with the key in your pocket. If you drop it, it will take 3 days for BMW to make a new one. It could mess up your trip. We did find mine when the beer garden opened in the am. Awesome post, and so glad that you enjoyed our side of the big pond. I am lucky enough to be able to experience, the sort of trip you had. I get away over the " River " between us and Europe , at least twice a year. So can understand what you experienced. My next big trip is going to be the Pyrenees, both French & Spanish side. Onto the Picos mountains, then onto Portugal. And returning via either Bilbao or Santander. And of course I have to agree about the bike, most awesome machine I have ever ridden. Most of the 18K miles on mine have been in the Alps and Pyrenees. Just a fantastic place to ride. make sure you include a day or two to explore Asturias, west of the Picos around Cangas de Narcea. I'm currently in Porto, having arrived in Santander on 19 Sept. Couple of days here exploring the city then head east for Bilbao. I'll catch the northern edge of the Pyrenees on the way to San Sebastian but the whole range will have to wait for another year. It was 36C in Porto when I arrived yesterday so I would suggest making the trip well before summer starts or around mid September onwards. I had a lovely ride through the Peneda Geres national park yesterday but I was seeking shady spots for a break and pouring water inside my jacket & trousers! Thanks for the Info, Trip is booked from the 15th September 2019 until 30th September. The heat should be a bit cooler by then. Dont want to wish the life away still it will come round before I know it. When we rode out of the track at Aragon on Sunday the K was showing 37c on the way back to the hotel currently a little cooler in the middle of the bay of Biscay. Nice trip! 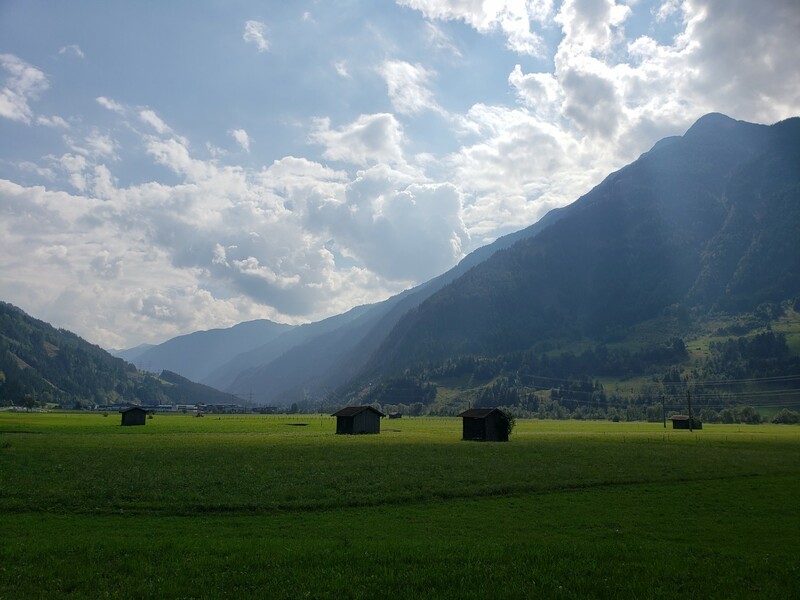 I did Switzerland a few years ago. I was in the Ardennes last week. Superb roads. Not quite 37°C, more like 12°C!